During the summer before my senior year of college I had the opportunity to work as a graphic design intern at the University of Arkansas division of Student Affairs, as part of NSFP. This experience was great for me to get time working in a group studio environment. The following are a selection of the projects I worked on while there. When I started my job I came in behind the old intern and continued on where they left off. I made a few edits to the front cover, but for the inside page I did all of the design. I like how the layout of the spread came out in print and how the dynamic, angular images create a tension in the design but also hold the text in place. Designed for the parents of incoming students, this brochure was my very first project working with NSFP. Using images from the previous and current years events, I created a layout that both delivered the necessary information via text, and also emphasized the imagery. Used as part of their leadership training for Rock Camp, this front page binder cover utilized the vintage Hog logo from the past but brought it into the modern era, following a similar smoky style that is used in many of the athletic posters and publications on campus. The lower blank section was left to print each individual's name for their own binder. When starting designing for a new event, the first thing we create is the Tabloid sized broadside poster. Below are a selection of just a few of the ones that I created under the direction of our art director and marketing manager. Some of these designs feature purchased and free use imagery/vectors and are not of my own hand. 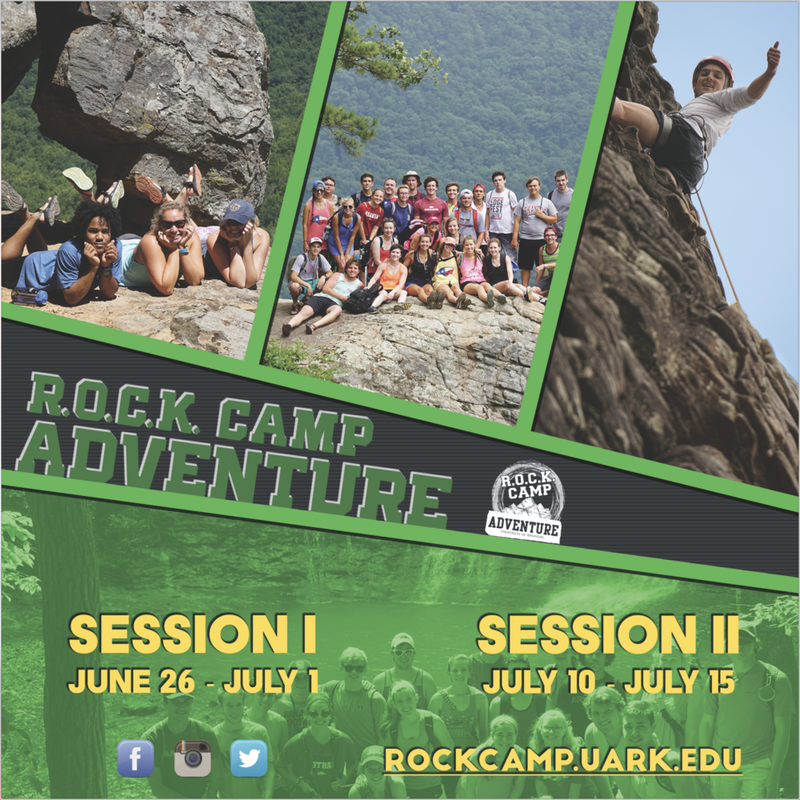 These large scale banners were created to inspire prospective freshman who are going through orientation to participate in NSFP's Rock Camp extended orientation program. This week long event involves team-building, games, competitions, and a float trip. 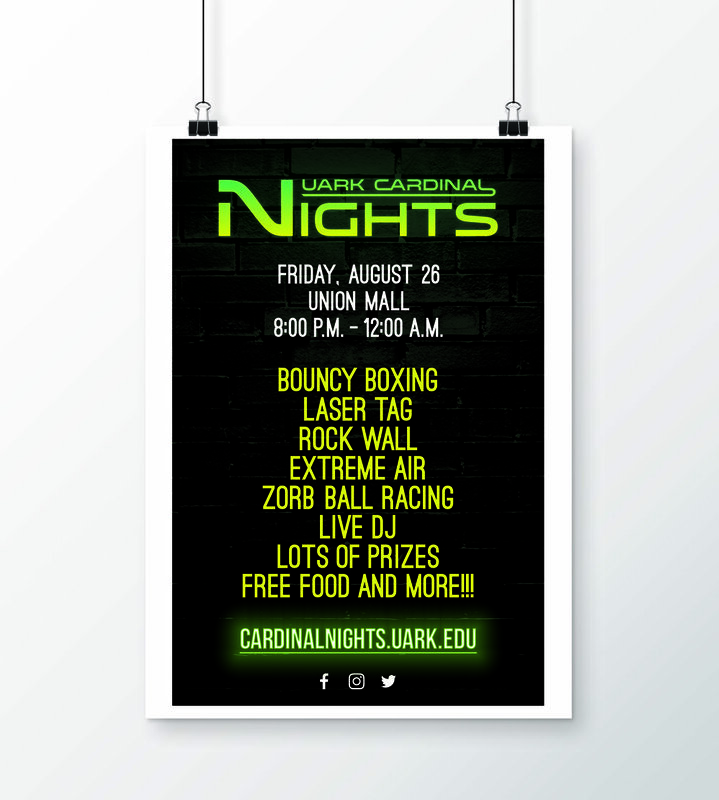 The 5ft x 5ft and 10ft x 2ft banners were designed entirely by myself and are hung around the campus union.